Let's see what paradise feels like to the male population, with Igor of Happy Interior Blog putting it into words and photos. feels like: Inner balance, genuine happiness and the soothing knowledge to love and be loved. 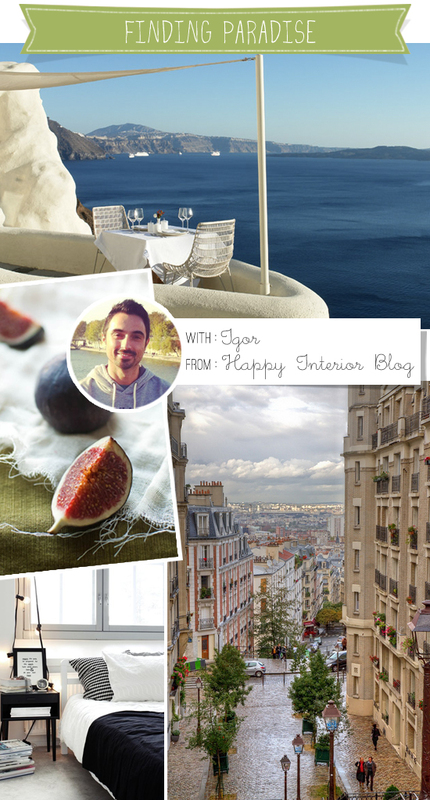 looks like: A sunny morning on the sea, happy faces, a street in Paris and a home you love. smells like: An enchanting concoction of the smell of fig trees, fresh herbs and a crisp, salty sea breeze. tastes like: Melting chocolate and a freshly brewed coffee in a street side café. sounds like: The voices of your beloved ones and your favorite, old song. Thanks Igor, that was purely divine! 13 comments on "Finding Paradise: Happy Interior Blog"
Thank you Eleni for having me over. It was a pleasure to travel to 'my kind of paradise' for your excellent blog series! Filakia! Another Great post, I enjoyed it a lot. Well done, both of you! Sweeet! Great definition of paradise! Lovely and refreshing! Nice post! That sounds like heaven. I could use a little Paris right about now. i enjoy reading Igor's blog, he gives you a happy feeling indeed! Lovely post and must say that I feel so connected with Igor's view on paradise. Warm regards to both of you. I love this series! Such a great post. Definitely sounds like paradise to me! Spot on Igor!!! We'd love to come visit your paradise!